Why don’t the police say sorry? Why is it harder to get the Police to say sorry and admit they were wrong, even just to show some compassion and consideration towards a person who has suffered – or claims to have suffered- at the hands of a Police officer – than it is to get them to pay tens of thousands of pounds in compensatory damages ? This to me is one of the most obvious symptoms of the unhealthy ‘us v them’ tribal mentality prevalent in many Forces which leads to a multitude of abuses and cover-ups, and which seriously undermines public trust and confidence in the Police. Imagine if you had a case of a fireman who had been deliberately – or even negligently – causing arson. Would you expect the Fire Service as a matter of course to presume that the victims of the fire were in the wrong, and do their damnedest to either stop a complaint being brought or ‘whitewash’ the result? I think we would all be outraged; but this is actually what is happening as a matter of routine in Police Forces up and down the country. I have recently concluded a hard-fought case against West Yorkshire Police which contains a disturbing example of this endemic problem. My client Oluwatoyin Binta Shinnel Azeez has kindly given her permission to tell her story. 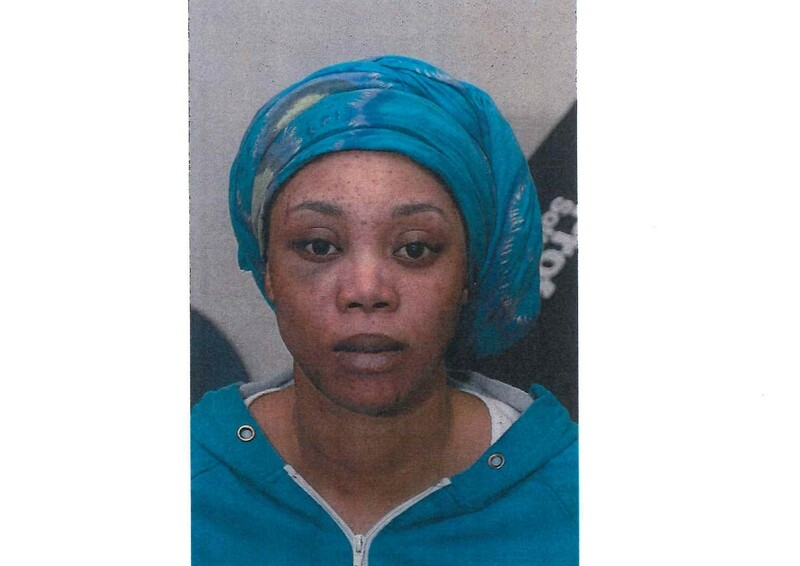 On 22 April 2014 she was at her home in Bradford with her young children (aged between 1 – 13), when officers from West Yorkshire Police came to her property, demanding to speak to Ms Azeez’s lodger (the teenage son of a family friend), who was living with the family at the time. Previous visits to Ms Azeez’s home by the Police to check on the lodger, who was at the time under a curfew order, had passed entirely peacefully, but on this occasion the lead officer, PC H, forced his way into the premises as soon as Ms Azeez answered the door to him, pushing her to the floor in the process. Ms Azeez is a law-abiding person of good character with no previous convictions. She had willingly answered the door to PC H, and the violence which he then displayed, in bursting past her into the house, was completely unjustified. Ms Azeez, in a state of considerable distress, protested to PC H that he had no right to enter her house in such a manner. She was at the time, dressed only in a loose-fitting kaftan, having been showering when the Police first knocked at the door. She now asked PC H to leave, whereupon he pushed her in the chest, making contact with her breast, and again knocked her to the floor. Now even more outraged and distressed, Ms Azeez got to her feet and demanded that PC H leave; in response he viciously assaulted her, grabbing her by the neck and pushing her against the wall. All of this was unfolding in front of Ms Azeez’s young children, and the impact upon them can easily be imagined. Injuries to Ms Azeez shown here. The Azeez children pleaded with PC H to release their mother, to no avail. 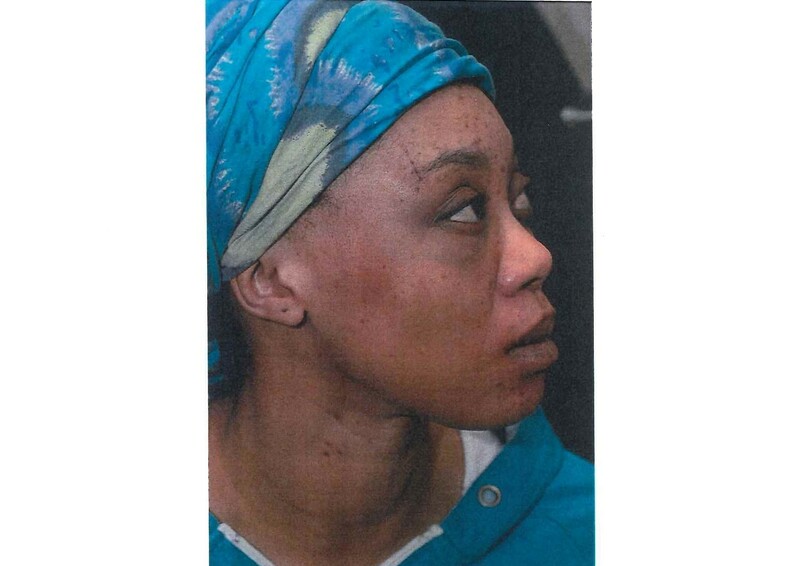 As Ms Azeez began to choke and feel lightheaded, PC H then escalated the assault by spraying CS incapacitant gas into her face at close range, and without warning. The gas spread throughout the close confines of the house, and also began to affect Ms Azeez’s young children, one of whom was a one- year old infant. Injuries caused by a police officer. PC H then dragged Ms Azeez outside and onto the pavement, causing her to fall and strike her head on the ground. Forcing Ms Azeez to keep her head down by kneeling on her back, PC H then handcuffed her arms behind her back and left her lying in the street. To the pain and degredation she was already suffering, was the added humiliation that she was wearing only loose- fitting clothing and felt exposed to the public view of her neighbourhood. Assault injuries caused by a police officer. PC H then returned and renewed his assault upon Ms Azeez, pulling her to her feet by her handcuffs and then pushing her back down, causing her to bang her head against her garden wall, and vomit. PC H then further tormented Ms Azeez by informing her that not only was she to be taken into Police custody (for no specified reason whatsoever) but that also Social Services would be called and her children taken away from her. Ms Azeez was then transported in the cage-section of a Police van to Trafalgar House Police Station, still without any explanation as to what she was being arrested for, or even that she technically was under arrest. At the Police station PC H falsely asserted that Ms Azeez had assaulted him, but after listening to his account, the Custody Sergeant refused to authorise detention of Ms Azeez on the grounds that PC H had not been acting in the course of his duty, as he had in fact had no right to enter Ms Azeez’s premises uninvited. Ms Azeez was then told she was free to go, but was offered no explanation or apology. Given her obvious injuries, the Custody Sergeant advised that she should go to the Hospital, and implied that she would be given a lift. She was directed to wait in the public waiting area. She did so for over an hour, during which time she was completely ignored by Police staff – offered not even so much as a cup of tea- and becoming increasingly worried about her children, who the Police had informed her had been ‘given’ into the care of another Mum at her children’s school whom Ms Azeez did not know well, and who had never looked after the children before. This had been done by the Police without any consultation with my client. Eventually, finding herself being completely ignored, Ms Azeez had no choice but to just leave the Police Station and walk home in the paper custody slippers she had been given (which soon disintegrated), injured and without any money or a phone. After walking some distance, she had to accept a lift from a stranger to get back home, in itself far from an ideal situation; fortunately she was soon reunited with her children, but all of the family were deeply traumatised by what had happened, and the children as well as Ms Azeez were still suffering from the effects of the CS gas spray which PC H had discharged in their home. Ms Azeez understandably brought an official complaint against the Police, but found the officers handling her complaint throughout to be generally unhelpful, rude and dismissive. The first action she took was on the morning after the incident, after she and her children had been seen at their local hospital. She telephoned the Police to lodge a complaint but was rebuffed by being told that the Police apparently had “no trace” of the incident! Disappointed but undeterred, Ms Azeez then attended Trafalgar House Police Station in person, after dropping her eldest child at school, to make the complaint in person. Her subsequent interactions with the desk officer constitute, in my view, a ‘text book’ example of the way the Police try to frustrate and deter complaints against them. Firstly the officer, who displayed a sceptical attitude to Ms Azeez throughout, tried to deter her by telling her that it was not easy to bring a complaint and that it could only be done via the internet (not true). He repeatedly tried to dissuade her from pursuing the complaint, before reluctantly agreeing to take her details (name and address) and go and “check” on the incident. Ms Azeez was now left waiting for over 2.5 hours – with her younger children and baby- before the desk officer informed her (and only after she approached him, not vice versa) that he hadn’t been able to find any trace of the previous evening’s raid on her home, or her arrest, and accordingly, had decided to do nothing – not that he had done her even the courtesy of explaining this to her! Ms Azeez was absolutely “gutted” by this outcome, but after being encouraged by friends, was strong enough of character to return to the station the next day to insist that the Police listen to her and open a formal investigation into her complaint. Knowing the hostile attitude she was going to receive from them, Ms Azeez had the foresight to bring sandwiches, a flask of tea and blankets in order to ‘camp out’ at the station, with her children, for as long as it took to get the Police to allow her to bring her complaint. Once again, the first officer she spoke to was dismissive and tried to ‘scare her off’ by saying how lengthy and complicated the complaint process would be. Undeterred, Ms Azeez stood her ground and waited for the 2 hours it took for a Sergeant to finally come and take her statement, during which waiting time she had to feed her infant son and change his nappy. Throughout the process of giving her statement, she found the Sergeant to be negative and critical of her account; he clearly did not approach the process of interviewing her with an open mind, and only made arrangements for her injuries to be photographed when she prompted him. 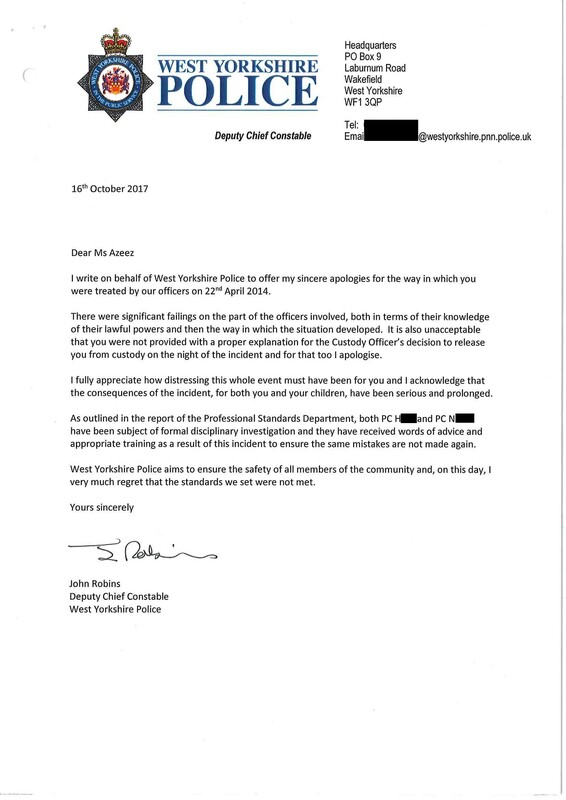 We may well ask; what state would society be in if the Police displayed this sort of attitude to investigating complaints against members of the public generally, and why do Police officers so often get ‘special treatment’ like this when members of the public complain against them ? Following an investigation which took over 15 months, it was concluded that although the officer did not have a lawful power of entry into Ms Azeez’s home he had “an honestly held belief” that he did. Accordingly, PC H did not have a case to answer in misconduct or gross misconduct but would “be given words of advice and appropriate training”. Ms Azeez felt deeply hurt, not only because of the vicious assault she had suffered at the hands of PC H, but because of the total lack of help or sympathy offered to her by the West Yorkshire Police as a whole, who rather than supporting her as the victim in this matter, seemed to rally behind and protect PC H. She instructed me to represent her as a specialist lawyer in actions against the Police, and I commenced Court proceedings on behalf of Ms Azeez against West Yorkshire Police for assault and battery, false imprisonment, trespass to property and breaches of the Human Rights Act. Following the institution of Court proceedings and just 2 weeks before trial, West Yorkshire Police agreed at a Joint Settlement Meeting on 29 September 2017 to a settlement of £25,000 in damages, plus Ms Azeez’s legal costs and, perhaps most importantly, and very rarely seen even in successful actions against the Police, a formal apology from the Assistant Chief Constable of West Yorkshire Police which is reprinted below. I ask you to bear in mind that this apology- as fulsome as it seems- was only extracted from the Police after over 3 years of costly litigation, putting a significant dent in the ‘public purse’ which ultimately must pay for Police misconduct and abuse of power. How much time, expense and heartache could have been saved if the ACC’s letter had been written to my client in September 2014 rather than 2017 ? However, that kind of open and conciliatory approach appears to be utterly alien to the prevalent Police mentality. Whilst the settlement terms achieved should go a long way to helping Ms Azeez put her life back together after this highly distressing incident, the memories of which have caused her to have to relocate her family from the Bradford area to London, I still feel that what happened to Ms Azeez and her family was truly outrageous. 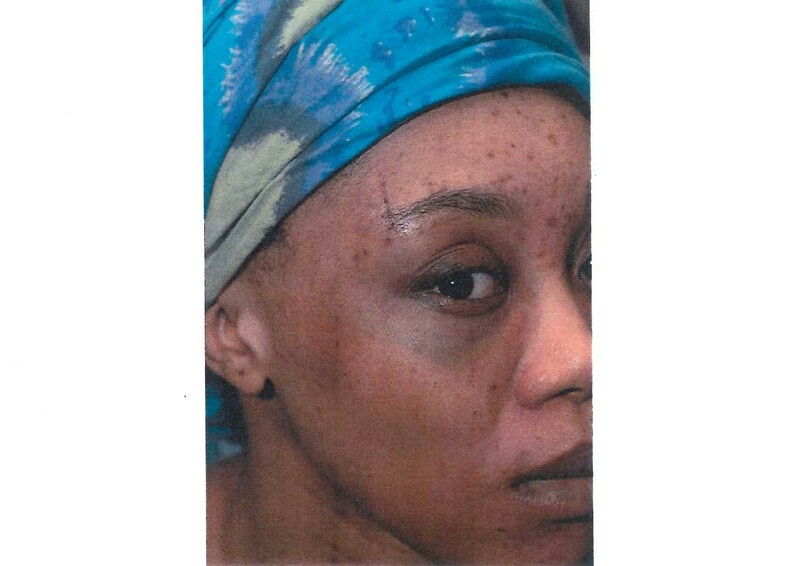 Obviously, the assault perpetrated upon her by an armed officer in front of her young children was absolutely unconscionable, but to me, equally shocking and deplorable was the way in which West Yorkshire Police as an organisation callously turned their backs on Ms Azeez once they determined that they had been wrong to force entry into her home, assault and then arrest her. It would have been a simple and straightforward matter at that stage for a senior officer to have offered an apology, some words of kindness and arrange immediate medical treatment and thereafter a lift home. Even just an explanation as to what had happened. As it was Ms Azeez was left completely in the dark both as to the reason for her arrest and the reason for her release. It seems that the Force was only interested in her if they could classify her as a villain; they had no concern for her as a victim – the victim of one of their own officers indeed. Having been assaulted in her home, effectively abducted, separated from her children and taken across town against her will and without any just cause, she was then to all intents and purposes ‘thrown out’ onto the street to make her own way home. Further insult to injury was added by the Forces’ usual approach to a complaint against its officers: treating the complainant with contempt. Eventually they did the right thing, but also because my client had the courage and conviction to pursue a court claim to enforce her rights. Should it really be this hard, and this rare, for the Police as an institution to be able to say “sorry”?